Ground-breaking scientific collaboration adds to calls to up-list cheetah status from Vulnerable to Endangered, and reaffirms the importance of Botswana for cheetah conservation. The cheetah may be able to run faster than any other animal, but it can’t hide from researchers determined to know how many of them remain in the wild. The importance of knowing how many cheetahs there are, and where they occur, cannot be overstated. Conservation management plans for the species rely heavily on this information. In particular, the International Union for Conservation of Nature (IUCN) uses this information to decide the status of a species. Cheetahs are currently classified as Vulnerable, but this research adds impetus to the call by conservation scientists to up-list the species to Endangered on the IUCN Red List. To answer the call for better information, a group of 17 conservation scientists, including five from Botswana, produced the largest dataset of verifiable cheetah records in history. Besides using their own records from collared cheetahs, track (spoor) counts, and camera traps, they sought to include photographs and videos produced by the general public for social media. Of the latter records, only those with a confirmed location and date when the image or video was taken could be included to ensure the greatest accuracy possible. Amazingly, they produced accurate population density estimates for 35% of the cheetah’s range in Botswana, Namibia, South Africa, and Zimbabwe. This level of accuracy is unheard of for large carnivores over such a broad study area. Indeed, their proven range for cheetahs in these countries is a vast 789,700 sq. km – 32% larger than the whole of Botswana! 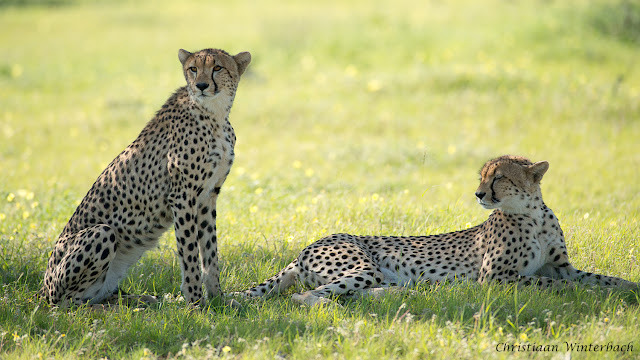 They further report that cheetahs could occur in nearly double that area, given the suitability of the remaining habitat for which they could not confirm cheetah presence. Despite the huge area, the number of cheetahs they estimate to live in the proven range is only 3,577 adults. Given the current Africa-wide population estimate for cheetahs is 7,100, this study confirms southern Africa as a stronghold for this species. Of the four countries covered by this study, Namibia and Botswana support more cheetahs than the other two countries. In particular, the ecoregion known as the Kalahari Xeric Savannah, covering south-western Botswana and central-eastern Namibia, supports the highest number of cheetahs in southern Africa. Due to its geographic location, Botswana is at the heart of southern Africa’s cheetah population. This makes the country of special importance to the species. Within Botswana, the Ghanzi and Kgalagadi Districts are likely to support most of the cheetahs, and are thus critical for conserving the species. Although the Central Kalahari Game Reserve and Kgalagadi Trans-Frontier Parks provide large protected areas within these Districts, cheetahs are known to thrive more outside of protected areas than inside. The main reason for this is that they are outcompeted by larger carnivores like lions and spotted hyaenas, which occur in high densities inside protected areas. Derek Keeping, Dr. Glyn Maude (Kalahari Research and Conservation), Rebecca Klein and Jane Horgan (both Cheetah Conservation Botswana) all contributed scientific records for cheetahs in Botswana. Although they provided valuable records for cheetahs living on farmland and protected areas in the proven cheetah range, large areas in the Kgalagadi and Ngamiland Districts that are considered potential cheetah range have not yet been surveyed. The new study revealed that understudied areas such as these in southern Africa could support another 3,250 cheetahs, which would further demonstrate the importance of Botswana and her neighbours for cheetah conservation. There is therefore much work still to be done, to more effectively count the current cheetah population in Botswana, and conserve the species for future generations.